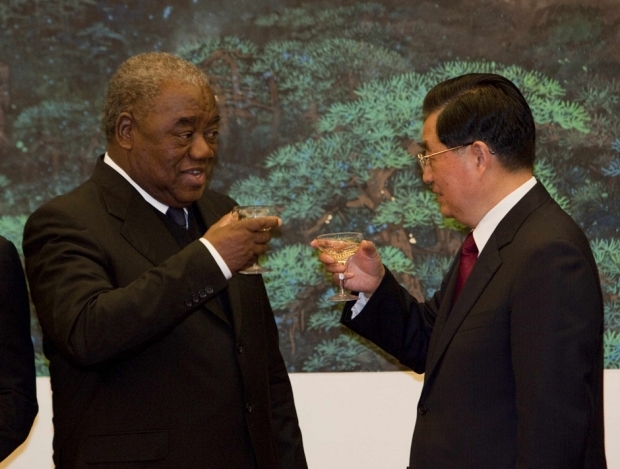 Zambian President Rupiah Bwezani Banda (left) shares a drink with Chinese President Hu Jintao (right) in the Great Hall of the People, Beijing, February 25, 2010. Banda was on a nine-day visit to boost trade and political ties with China, which is a major investor in the Zambian copper mining industry and general infrastructure-building. The world is abuzz over a number of recent large-scale infrastructure-for-resources deals China has signed in Africa. While some observers see these agreements as a force for good in local economic development, others have gone so far as to call the activities part of a perfidious, neo-imperialistic resource grab. Beijing is accused of perpetuating corruption, of obstructing progress on human rights, and of propping up dictators like Omar al-Bashir of Sudan and Robert Mugabe of Zimbabwe. Where does the truth lie? How exactly are Chinese investors being received in Africa and how do their projects differ from previous Western-led efforts? Joining Kaiser to discuss these questions are Gady Epstein, Beijing Bureau Chief for Forbes magazine, our own South African correspondent Jeremy Goldkorn, and Shannon Van Sant, an American journalist whose reports about China in Africa have recently aired.